These were ready in the oven in 20 minutes! Quick and clean. My friend on maternity leave had to go back to work today after a year off. Poor her. Boo hoo. She is on my mind and now going back to work is also on my mind (4 more months). So I'm starting to think about recipes I will be able to make quickly on a week-night. Some of my recipes have definitely been stay at home mom or weekend warrior recipes. Not always easy to quickly whip up in minutes. But this chicken thigh recipe is easy peasy. You could defrost the chicken and put it to marinate before you go to bed and quickly broil it in the oven when you get home from work. I buy my boneless skinless chicken thighs fresh at Costco. Its a big package so I split it in three and usually freeze two packs for another meal. You could even marinate it before you freeze them if you are really forward thinking - I like to experiment so that's not up my alley but whatever gets you through the day, week, month eating clean. I'm all for it. They are a nice change from chicken breasts, full of flavor and always turn out tender. This recipe could also be done on the grill (if it would ever stop snowing in Winnipeg). I really kept the marinade and basting light. I am trying really hard to cut back on sugar and keep it clean (at least early in the week). If you feel it needs more feel free to double the marinade or honey. But hubby thought they were really good as is. Just do lots of basting with the juices and you will be good. 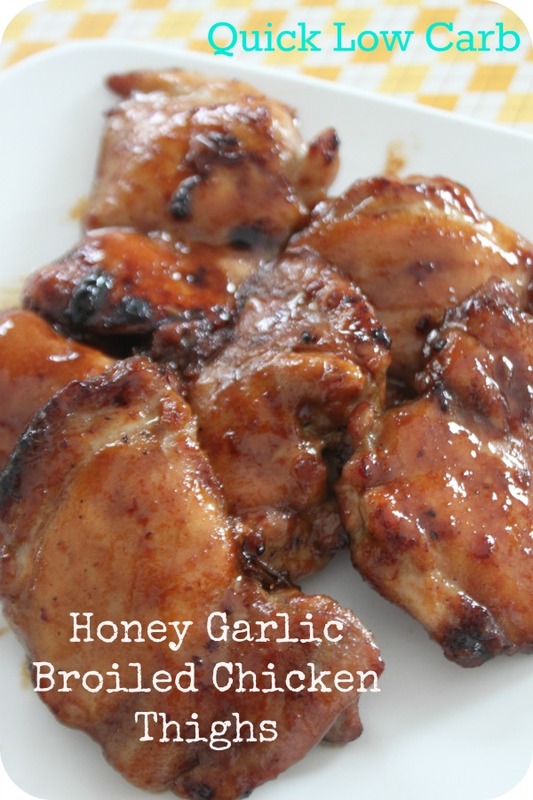 Mix oil, soy sauce, ginger, garlic and pepper together and pour over chicken thighs. Put in the refrigerator to marinate. Stir a couple of times to ensure entire thigh is being marinated evenly. Put rack in oven so its is approximately 7 inches from broiler. Turn oven to broil (high) and let preheat. Put chicken in a 9 x 13 baking dish. Bake for 10 minutes on first side. Turn. Bake on second side for 8 minutes. Turn. Microwave honey/apple cider vinegar for 20 second to warm and mix. Baste chicken with honey mixture and bake for an additional 1 minutes. Turn again. Baste and bake second side for an additional 1 minute. Remove from oven and baste again with juices from the pan. I baked for a total of 20 minutes and they were perfect but adjust for your oven. Serve and enjoy. Quick side note - I kept my Kindergarten home today since I feel my maternity leave slipping away and because I could.............we had fun when they (all three munchkins) weren't driving me crazy and making a mess. And we came up with a way to get rid of flour (that I don't cook with anymore and have 10 lbs of in my "bunker") and table salt (because I now only use sea salt)..............home made play dough. Fun! What a great way to use up that refined "dirty" white flour you have sitting in your cupboard that you don't cook with anymore. Home-made play dough. It turned out great. I got the recipe from the One Perfect Day blog and it turned out awesome. I scented mine with Rum Butter oil so the kids smelled like they were in the liquor cabinet - oops. It was kind of fun to make and really easy. The kids love mixing and it kept them busy for quite a while so I was happy! Thanks for stopping by. Just stumbled upon this comment as I went to make these again today! Hmmm, might try some lime.